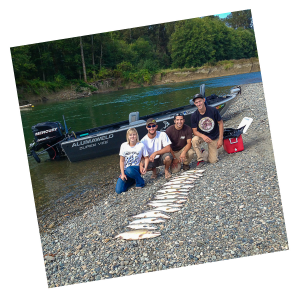 Washington Halibut Charters, Olympic Peninsula Fishing Guide on the – Sol Duc River, Calawah River, Bogachiel River, Clearwater River & Hoh River: Washington Rivers & Salt Water Charters, Here are the Water ways we guide on! Quality bait and tackle are furnished for all Gear Fishing Trips. Quality Flies and tackle are also furnished for all Fly Fishing Trips. We use only the Best Equipment on the Market! Our boats, a 16’8” fully heated Hyde Drift Boat, a 20’ Alumaweld Super Vee, 26′ Coastal Express, or a 14’ NRS Fishing Raft (for low water conditions), Note: Salt Charter trips on a 26′ King Fisher Coastal Express Boat. If you have a special Fishing Pole you like using your always welcome to bring it. A deposit of 50% is required prior to all trips and is refundable, if cancelled within 15 days of the trip. Blown rivers / low rivers or unforeseeable acts of nature, causing trips to be cancelled will be rescheduled to a suitable date. If you don’t see what you like, just ask, I’d be glad to put a package together for you. Loren Morris – Guide/Owner, USCG Licensed Captain, Insured, CPR Certified/First Aid Trained. Amazing views and wildlife, bring your camera! 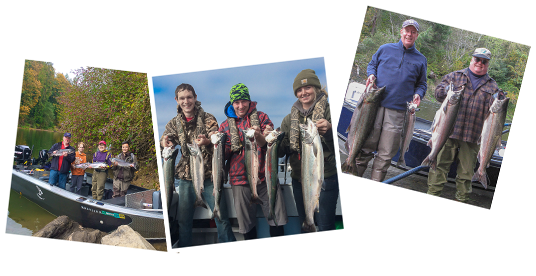 Fishing Trips require Current Washington State Fishing License & Punch Card. (available at most sporting goods stores like Ace Hardware, Fred Meyer, or online) or 1 day fishing trip license available on the day of trip from the Captain for $10. Rain Gear is highly recommended on any trip. Waterproof boots, hip boots or waders. 1 day Fishing Licenses are sold on the boat for $10 required for 15 and older (if you don’t have one already). 15%-20% Gratuity for the Captain/Crew is customary.